A short walk from St. Stephen’s Green, Merrion Square is a public garden in Dublin. The small park is Dublin’s most beloved Georgian Square – meaning that every building on three sides of the park has been designed in red brick Georgian architecture. Merrion Square is the best preserved of Dublin’s five Georgian Squares (the others being St. Stephen’s Green, Fitzwilliam Square, Parnell Square and Mountjoy Square). Merrion Square has been one of the most exclusive addresses in Dublin since the day it was developed. 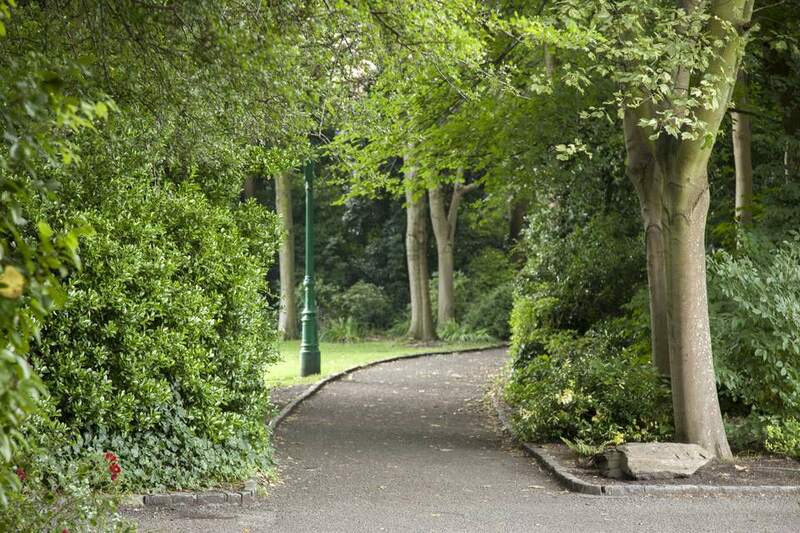 With famous former residents and landmarks, here is the complete guide to Merrion Square. Merrion Square was first developed in 1762 and remains a fine example of Dublin’s most formal architecture as well as the city’s aristocratic past. The square came to be because of its proximity to the palace built by the Duke of Leinster (which is now Ireland’s Parliament). Three sides of the park are surrounded by uniform Georgian buildings. The townhouses were built separately over 30 years but each had to follow strict design instructions to ensure a similar style was used for each. Until the 1960s, the park was private and access was only granted to residents. The square was then handed over to the Dublin Corporation and the city helped to restore the park in Georgian style. The park inside the square was originally named "Archbishop Ryan Park" after the Catholic archbishop who transferred the area to the city. However, it was renamed Merrion Square Park in 2010. The exclusive square has been home to some of Dublin’s most famous residents. Oscar Wilde lived at No. 1 Merrion Square, and W.B. Yeats called No. 82 home (but complained that the buildings were drab and too 18th century in style). In addition to well-to-do artists, the square also attracted politicians and judges. Daniel O’Connell, a key figure in Irish history, lived at No. 58 Merrion Square. Merrion Square is primarily a public green space in the center of Dublin. The small park is open during daylight hours and has wide open lawns and tidy flower beds. The manicured square is a popular place for a short stroll to take a green break in the heart of Dublin. The square is particularly frequented by students from nearby Trinity College who come to lounge on the lawns on sunny days. The most famous attraction is the colorful statue of Oscar Wilde reclining on a rock in the northwestern corner. Another landmark within the park is the Rutland Memorial. The stone monument was once a fountain dedicated to Charles Manners, Fourth Duke of Rutland. It was designed to provide water to the city’s poor, and the water flowed from two bronze lion heads which have now been removed. On Thursdays, a lunchtime market pops up in the square and various booths offer a wide range of street food from 11:30 a.m. to 2:30 p.m. More interested in art? Artists are known to display their work on the outer railings of the park, particularly on Sundays. There are limited facilities in Merrion Square, but the park does have a small playground for children that was renovated in 2014. Given Oscar Wilde’s connection to the square, the playground has a theme based on his short story The Selfish Giant. There are also pathways for leisurely walks, and a central floral garden. Note there are no public restrooms in Merrion Square, but you may be able to use these facilities at the nearby National Museums, which offer free entry. Three sides of Merrion Square are filled with Georgian buildings. Many of the Georgian buildings that surround the square are privately owned (with most being offices), however, it is possible to visit some. No. 63 Merrion Square, for example, is the most intact Georgian building which retains the most original character and the back garden has even been redesigned in Georgian style. It is appropriately owned by the Royal Society of Antiquaries of Ireland and sometimes hosts public events and lectures. The fourth side of the square faces the Natural History Museum, Leinster House and the National Gallery of Ireland. The National History Museum is a part of the National Museum of Ireland and has several permanent exhibits of the (taxidermy) animals and plants that have made up Irish wildlife over the centuries. Leinster House was once the Dublin home of the Duke of Leinster but has served as Ireland’s house of parliament since 1922. Guided tours are available to the public, but be sure to bring official ID to be granted access to this important government building. The National Gallery of Ireland has a lovely collection of art, some of which was donated by George Bernard Shaw. The art museum has an emphasis on Irish artists and showcases work by famous and lesser-known national artists. Best of all, the permanent collection is free to visit. A short walk away is Trinity College, one of Dublin’s must-see sights. Here you can stroll through the beautiful university grounds, take a tour to visit the library or book a visit to see the famed Book of Kells.